Considering all of the negative side effects that can come from losing teeth, it is important to replace them as soon as possible. When it comes to replacing teeth there are several restoration options available including dental implants, dentures and dental bridges. So, which of these options is the best tooth restoration method? Many people are stuck when deciding which restoration option to go with, weighing the benefits of each against the cost. Here we will compare the three restoration options to help you understand what each one is and which one will be the best for your situation. Dental implants are artificial tooth roots made out of high grade titanium and implanted directly into the patients jawbone. The titanium post is used to mimic a natural tooth root by being surgically placed into the jawbone and fusing with the surrounding jawbone over a period of 3-6 months through a process known as osseointegration. This fusing creates a solid base, much like that of a natural tooth root, giving patients a natural and comfortable feel. 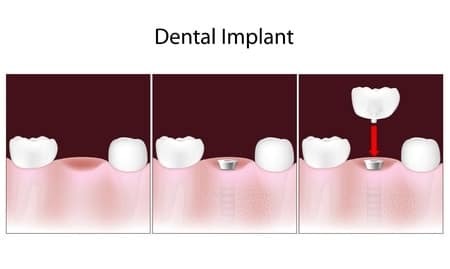 Closest thing to natural teeth – since they are implanted directly into the jawbone, dental implants are highly durable, feel natural and are aesthetically pleasing. They don’t only look like natural teeth, they feel like it too, allowing patients to chew and speak as comfortably as they did before. Great way to preserve the jawbone – osseointegration between the jawbone and the dental implant stops your jawbone from deteriorating by filling the gap left there from the missing tooth. This results in not only aesthetic benefits, but also reduces the risk of the remaining teeth shifting or tooth decay, as long as you maintain good oral health of course. Self confidence restored – Due to their resilience and natural fit, you won’t even realize that you were ever missing a tooth to begin with. This will allow you to go on with your life as you did before losing the teeth. Most costly tooth restoration method – dental implants can be quite costly, costing around $1100 on the lower end for a single dental implant and are rarely covered by insurance. The cost does pay itself in the long run though considering that they will last a lifetime if taken care of properly. Potential for surgical complications – since they do require a surgery to be placed, some complications may come out of it such as; your body rejecting the implant, swelling & pain, nerve & tissue damage and infections. These are, however, rare with the average success rate of dental implants being higher than 95%. For a very long time dentures have been one of the most, if not the most, popular tooth restoration methods available. They are removable prosthetics that can be used to replace anywhere from one tooth to an entire arch of missing teeth. Dentures are a combination of plastic or acrylic teeth supported by an acrylic artificial gum. A complete set of dentures to replace a full arch of missing teeth is secured into place with a mild adhesive that can be easily be removed for cleaning every evening. Partial dentures have a similar look with artificial teeth attached to an artificial gum and are secured in place with clasps that latch onto remaining natural teeth. Affordability – if you don’t want to break the bank, dentures are a good option. They are known to be the cheapest option due to their simplicity, and are even partially covered by insurance in most cases. Simple to install – dentures, unlike implants, do not require any surgical procedure making them very easy to work with. They can also be easily modified to accommodate more lost teeth at a low cost. Deterioration of the jawbone and facial structure – dentures do not put the same type of pressure on the jawbone that dental implants do, which will cause it to deteriorate. This recession of the jawbone will in turn cause the lower facial structure to seem like it is caving inwards over time. 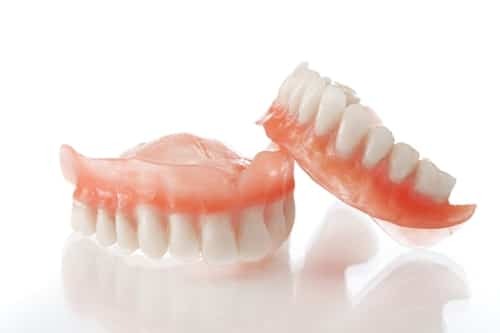 Low durability and discomfort – dentures can cause discomfort by placing too much pressure directly on the gums for complete dentures, or by pulling at existing teeth in the case of partial dentures. For this reason, they should be removed every night to give the gums a rest, and to give them a good cleaning to minimise the buildup of bacteria. When they are removed there is a higher chance of breaking them, if dropped for example. Abutment teeth – these are at either end of the dental bridge and are essentially hollow crowns that act as anchors for the bridge. The abutment teeth are attached to natural teeth adjacent to the gap of missing teeth. Pontics – these are the teeth that bridge the gap. They are artificial teeth attached to the abutments at both ends and are used to replace the missing teeth. In order to complete this process, the adjacent natural teeth must be strong and healthy to act as supports for the abutment. They must also be shaved down to an ideal size and shape for the abutments to fit properly. Aesthetically appealing – depending on the dentist who is conducting the procedure, and who is in charge of creating the bridge, they can be as appealing as a dental implant, or natural tooth for that matter. Simple and affordable procedure – all that is required here is shaving down two teeth and making a good looking bridge to fill the gap. Since no invasive surgery is required the cost is lower than implants and does not require long healing periods. Another bonus is that if the bridge is damaged, it can be quickly replaced. Natural teeth must be damaged – since the abutments need to fit securely onto natural teeth as anchors, those natural teeth need to be shaved down to resemble a post. This process is irreversible in the event the patient wants to get implants in the future. This also increases the chances of cavities and tooth decay in the shaved down teeth. Not very long lasting – bridges are not very durable and need to be replaced most often no matter how well you take care of them. On average, dental bridges are replaced every 5-10 years. Get dental implants if you have the required oral health, upfront investment and willingness to undergo an invasive surgical procedure. This will pay off in the long run by protecting your oral health and facial structure, and by saving you the cost of a replacement procedure. If you are a smoker and not willing to quit, stay away from implants as smoking increases the chance of infections and implant failure. Get dentures if you are looking for a temporary solution until you have enough money to get dental implants, if you do not have the oral health requirements to receive implants or if you have health problems that may increase the chance of implant failure such as an autoimmune disease. Get dental bridges if you are looking for a quick, stable and natural looking solution that does not require surgery or if you have some of the health issues that will deter you from getting implants.